For quantitative determination of xanthine oxidase enzyme activity. • Sensitive and accurate. Use as little as 10 µL samples. Linear detection range in 96-well plate for 20 minute incubation: 0.03 to 25 U/L xanthine oxidase for colorimetric assays and 0.01 to 2.5 U/L for fluorimetric assays. Xanthine Oxidase catalyzes the oxidation of xanthine to uric acid. In addition, xanthine oxidase can catalyze the oxidation of hypoxanthine to xanthine, act on certain purines and aldehydes, and in certain cases produce the superoxide ion. Clinically, xanthine oxidase activity in blood can act as a marker for influenza, liver damage, and possibly cardiovascular health. Simple, direct and high-throughput assays for measuring xanthine oxidase activity find wide applications in research and drug discovery. 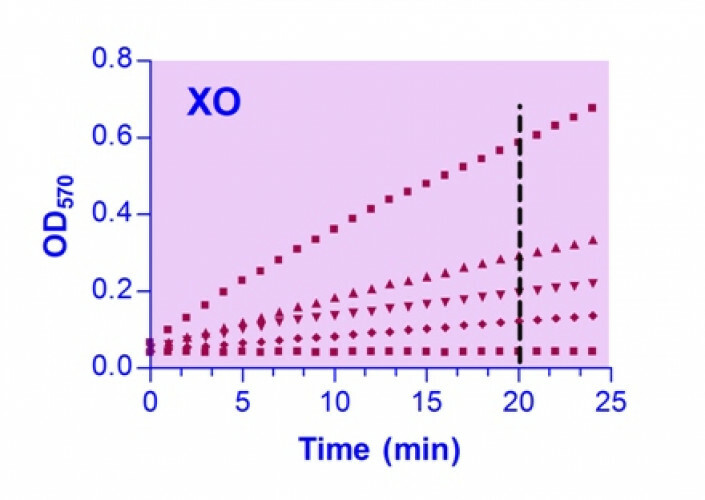 BioAssay Systems’ xanthine oxidase assay kit uses a single Working Reagent that combines the xanthine oxidase reaction and color reaction in one step. The change in color intensity of the reaction product at 570 nm or fluorescence intensity at λex/em = 530/585 nm is directly proportional to xanthine oxidase activity in the sample. Applications For quantitative determination of xanthine oxidase enzyme activity.